The syndicate specializes in swallowing dollarsin a bid to by-pass anti-money laundering operatives at the airport. 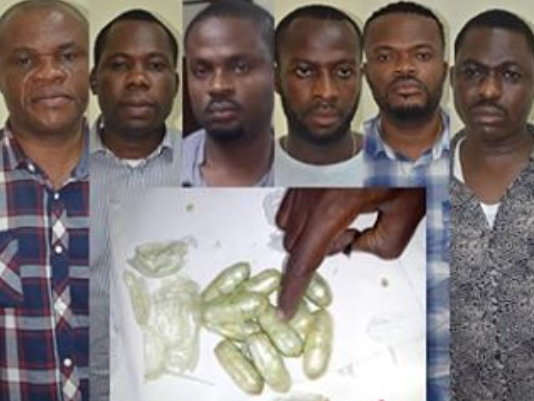 The men identified as Kingsley Nwokenta, a bureau de change operator also known as Buchito; Augustine Onwuasoanya, 54, and Christian Okoli, 35, both based in Brazil; Uzoma Ezenwa, 33, a hotel manager; Ikenna Ezenwa; and Emmanuel Nwokenta. Inset is a photo of the dollars wrapped for swallowing.